The Almighty Jet Ski Has 500 HP! - Muscle Cars Zone! The Almighty Jet Ski Has 500 HP! When it comes to speed, we all love it in every different size and vehicle it comes. So, in the following video we shift a little bit and instead of cars, we enjoy in the speed of an almighty Jet Ski. These tiny but powerful boats are used for fun as much as they are used for feeling the real speed. If you have ever wondered what it sounds and what it looks to drive a 500 HP jet ski, the answer can be seen in the short video down below. 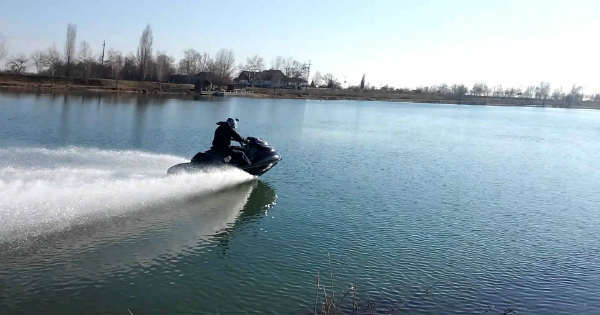 Though the lake is not very big it is still enough for the Jet Ski to unleash its power. It takes no longer than couple of seconds for this all-black beast to launch itself leaving behind mist and huge waves. So, you are probably thinking that making a sharp turn is impossible, right? Well, this guy manages to tackle them with ease, probably because he is highly skilled and experienced driver. After all, not everyone is capable of controlling the almighty Jet Ski and its 500 HP. The video was filmed well over a year ago on a cold day but nothing can stop it. What do you think, would you ever dare to drive one? Finally, check out the top 10 luxury Jet Skis!